De Gillett Cox graduated in 2012 with a Bachelor of Fine Arts from Queensland College of Arts (QCA), Griffith University, Brisbane. De’s recklessly sumptuous paintings offer an unfettered celebration of life. She is inspired and obsessed with colour— the brilliance of tropical light, joy, sensuality, motion and emotion. Conceptual depth and technical excellence are layered in De’s habitually highly textured paintings. 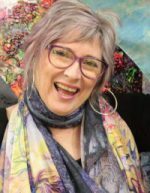 She works across an eclectic variety of subjects using a comprehensive range of media including acrylics, mixed media, drawing, oils, and inks.